Enjoy the visit of Syracuse, one of the most popular and important cities of the ancient history, accompanied by one of our expert guides. Cicero himself defined Syracuse as ”the biggest and most beautiful city among all Greek cities”. Then Noto, one of the late baroque towns of the Val di Noto, which has been declared World Heritage by the UNESCO and the coast of Vendicari, which has been awarded with the “Blue Flag” due to its high quality water. 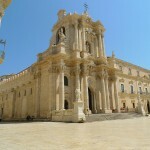 The first stop is Noto, where we will visit beautiful Baroque buildings, including the Cathedral of Noto, San Domenico church and Palazzo Villadorata. Then we will drive eastwards into the nature reserve of Vendicari, where we will reach the beautiful Calamosche beach after a short walk. Vendicari is a real paradise for birds. Flamingos, storks and cormorants can be observed here and sometimes even pond turtles. After a refreshing swim in the crystal clear water, it is time for the wine tasting and lunch at the winery BUONIVINI of Planeta. Here you can try different wines such as Cerasolo Vittoria di Santa Cecilia and the dessert wine Passito di Noto. For lunch you will have the choice between a snack or a complete meal of Sicilian delicacies. In the afternoon we will drive to Syracuse to visit the Ortigia peninsula where you can admire the Cathedral of “Saint Mary of the Immaculate Conception” erected on the ancient Greek temple of Athena. The visit of Ortigia also includes a stop at the “Fonte Aretusa”, a fresh water spring with a fountain. Tour is easy and accessible to everyone. 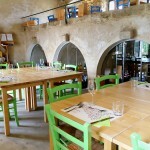 Guided tour to the vineyard, tasting of four different wines, followed by a light lunch consisting of selected appetizers, pasta made in a Sicilian traditional way, seasonal vegetables, seasonal fruit, small sweet treats and espresso. Prices related to groups of 4-6 people. For groups of more or less than 4-6 people please ask for the price. If you have any food requests (vegetarians) or health problems (allergies etc), please let us know. On request possibility to plan the visit of the wine cellar without jeep tour.